Let’s line ‘em up boys. 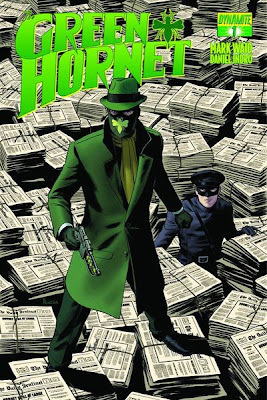 It’s been an unusually long work week so let’s knock back some Green Hornet from Mark Waid, Ethan Van Sciver’s take on The Dark Knight starring Mad Hatter and listen to Cracker’s Low as the soundtrack to the latest Doctor Who — in space! I wished to keep this as a two word review: “Mark Waid”, but we all know you deserve my usual insight and over use of exclamation points to extoll the virtues of another fine comic from the man that brought us Kingdom Comeand delivers every month with a fantastically positive and anachronistic Daredevil comic for Marvel. His digital publishing initiative under the Thrillbent banner continues to add value to the comic market by offering a platform for writers and artists to take advantage of the digital form. Mark’s take on The Green Hornet is on pace with his Daredevil work. The changes to the mythos are subtle enough to pay tribute to the history all the while introducing elements of suspense and modern comic storytelling. Newspaper man Britt Reid is the great nephew of The Lone Ranger and uses his financial resources to infiltrate the mob from the inside and do damage from the inside. Of course Kato is there as his chauffeur and confidante. This issue has it all in order of scale. The scene is 1941 Chicago. We go from Britt’s office to his lair to reveal his car Black Beauty. From there the duo hits the docks as the world’s first ‘super-criminal’. Britt uses his and Kato’s fists to clean up the city as well as The Fourth Estate to bring down criminals. Waid cites Citizen Kane as an inspiration for the story. Get on board fast with this book. Mark Waid is the master of the first issue, leaving us with a serial cliffhanger while packing a rich storyline with resolution in the first issue. I hope Dynamite is able to match Daredevil sales on issues and trade paperbacks with this book. It is a fun ride shotgun in Black Beauty. Newcomer artist Daniel Indro pleases us with his realistic storytelling and dynamic action. This book was the ‘adjectiveless Spider-Man’ of the New 52 at it’s inception. DC gave David Finch a fair shot of writing a Batman book that he would illustrate. I was aboard for the first few issues then dropped it for lack of interest in the story. I mean, I was already going broke picking up Bat-titles from Morrison, Snyder, Daniel and Simone. I joked around on my podcast as not considering Batman: The Dark Knight canon. This was a book I was picking up for the art anyway. A few creative team changes later I was delighted to see Ethan Van Sciver on art duties for the book written by bestselling author Gregg Hurwitz. OK, OK, I can recognize this as canon now! Van Sciver and Geoff John’s Flash: Rebirth brought Barry Allen back to the DCU back when I was getting back into comic books after an unusual nearly 10 year break. I’d always loved The FlashTV show, so Barry coming back was a big deal to me! Van Sciver’s art is the kind I admire because I could never draw like him or McFarlane or Rags Morales. More lines and detail please, thank you! Here in issue #18 we go to the dark place of the New 52 Secret Origin of Batman rogue The Mad Hatter. As a pre-teen boy, Jervis Tetch is teased about his height but is given the choice of taking enhancing growth hormones. “One pill makes you bigger”. Hurwitz threw me for a loop with the subtle Alice in Wonderland reference. Jervis asks the girl he is crushing on, also an Alice, to the dance and ultimately gets friend-zoned. Let’s just say that years later when Jervis puts on his top hat that he doesn’t forget about poor Alice when he pays her a visit. Catwoman makes an appearance and there is some flirty tension as she pulls a Jason Todd and steals a Bat-hubcap. Bruce obviously has a panic attack or lack of reason so he shows Selina all of his secrets and reveals his identity to her. Not really sure where that element of the story is going but we will see. Is it just a bad trip? We hope so! Great issue and great art but I want to see Ethan Van Sciver draw more Bat-action. If he filled in for Capullo on Snyder’s book I think we would see more action but hopefully Hurwitz has more in store for The Dark Knight coming soon. I am on board and recognizing this as canon so bring it on! Lots of Who stuff to be excited about with the return of Series 7 and the 50th anniversary this year. So how about the comics? Yes. 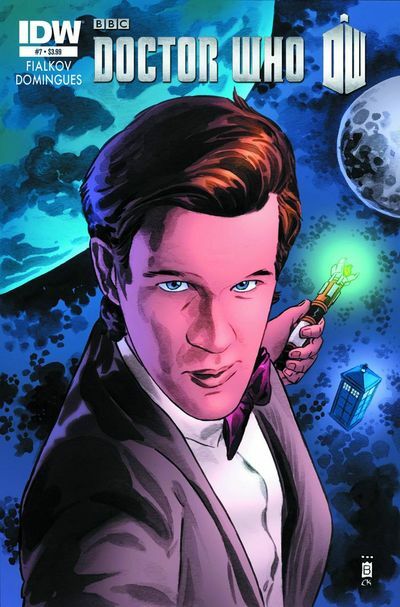 Even more timey-wimey enjoyment can be found with The Doctor in the pages of your favorite four-color fare. IDW’s Doctor Who: Prisoners of Time showcases a one issue adventure from each of the Doctors, with an overarching story of kidnapped companions. The regular ongoing Doctor Who from IDW starring the eleventh Doctor played by Matt Smith has a rotating roster of talent including Andy Diggle and Mark Buckingham. The latest is a space race story written by Joshua Hale Fialkov (I, Vampire) and drawn by Horacio Domingues. The Doctor heeds a call from a cosmonaut in 1961 after he loses his comrade in a spacewalk to one of the most deadly species in the universe, Vashta Nerada. Vashta Nerada were last scene in the Tenth Doctor episode Silence in the Library. The shadow virus swarm traps the Doctor out of the TARDIS and they are forced in the tin can of the Vostok capsule. Life support is running out as we leave the Doctor and cosmonaut there to face the swarm cloud. Domingues and Ponce deliver great and clean line work in the style of Jamie McKelvie or Ming Doyle, and the colors by Adrian Salmon are the right balance of subdued and flat without being boring. Looking forward to this creative team next issue and more from them in the future.